Welcome to my tour stop for Lindsey: Love and Intrigue by Kimberly Kolb. 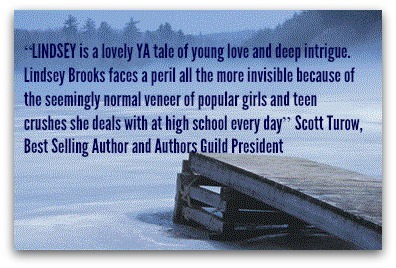 This is a young adult mystery and the tour runs Nov. 16-27th with reviews, interviews, guest posts and excerpts. Check out the tour page for the full schedule. Below you’ll find a guest post from author Kimberly Kolb – thanks so much, Kimberly, for taking part! So you want to look behind the curtain? (That makes me think of looking behind the curtain in the Wizard of Oz!) That’s what The Write Stuff is intended to be, a look at an author’s perspective from the behinds the scenes at the development of a book. In this case I will give a behind the scenes look at the writing of my novel, Lindsey: Love & Intrigue. On my website you will find more information about my book including summaries such as “Lindsey is a riveting literary experience, Lindsey takes readers on a journey of love and intrigue. Captivating, this work brings to life the true meaning of friendship and what it is like growing up in high school.” Here I want to share some insight about my book that you might not realize while you (hopefully!) read my book. I have decided to write this as a top ten list, I hope you enjoy it. 10. Some of the main characters in ‘Lindsey,’ are cast in their high school’s play, Dracula. When I was 10 years old I saw Dracula on Broadway, it was 1977 and I was with my brother and cousin, Joe. It was the first drama I had ever seen on Broadway. 9. Many of the female character’s names are taken from the female cousins on one side of the family and an aunt. Although their characters are completely fictitious, my cousin Elizabeth is a sweetheart! She is nothing like ‘hurricane’ Elizabeth in my book. 8. The protagonist’s name, Lindsey Morgan, would have been the name of my third child had he been a girl. 5. The breed and name of Lindsay’s dog, an Airedale terrier named Baron, was a nod to my beloved Baron. Not the smartest dog, but completely adorable and lovable. 4. Yes, I was a gymnast (like our protagonist, Lindsey) but as much as I loved the sport, I wasn’t very good. It was fun to ‘play’ a really good gymnast in my mind while writing this! 2. I decided to write this book after reading the Twilight series. I loved those characters and missed them when I had finished the books. Writing was a way to create characters I loved as much and could carry with me for the rest of my life. I could answer just about any question about my central characters, that’s how well I feel that I have them flushed out in my mind. 1. I have written about ½ of the sequel to Lindsey: Love & Intrigue. It picks up the day after this first book ends and so the mystery side of this romantic thriller is in full stride on page 1! Lindsey feels the demands and pressure from school, gymnastics, and her parents as she battles insecurities to build friendships while steering clear of the many land mines in high school-such as the group of popular girls she has dubbed the “Fab Five” Busy with activities and consumed with thoughts of her secret crush, Chris, she takes little notice of what’s happening around her. She gets a flat tire, gets caught with the lights-out and starts receiving strange text messages-things she assumes are just high school pranks gone too far. Her father wants her to be able to handle herself, so she should be able to handle this. Kimberly Kolb earned a bachelor of science degree in industrial organizational psychology from the University of Illinois. She began writing while waiting for her daughter to finish ballet and tap classes. Kolb lives with her husband and three children north of Chicago. This is her debut novel. Kimberly Kolb received the Editor’s Choice and Rising Star Award from iUniverse. Oh, I’m glad to see that map! I thought Isabella’s house was on the other side. Like Joe and Mike and Isabella were swapped. That’s how I pictured it. The rest looks about how I had it in my mind though. Thanks so much for hosting a tour stop Jenna!